Konecranes is a bold and future oriented and committed company. They wanted us to figure out new ways of operating the crane in industrial environment, and that the concepts we would develop, should utilize augmented reality (AR) and/or wearables. As Kimmo Rantala, the senior UX-designer said, “we want to be the first crane manufacturer to launch practical AR solutions”. So after reviewing some literature related to their work and going through research in-situ we defined our main experience goal as following: “To give the crane controller the control over his/her job environment through new technologies”. However, though the feeling of control is the main experience goal, each concept has support experiences (sub x-goals) supporting them. For the applicable solution we chose safety, effectiveness, completion, empowerment and fellowship whilst the radical has empowerment, self-development, fellowship and relatedness as their sub x-goals. 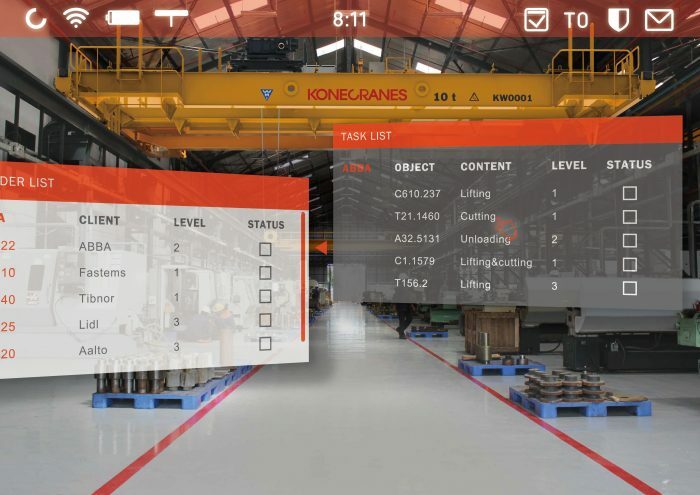 The crane assistant application is a practical solution designed for AR glasses that gives the experience of control to the workers by empowering their skills and professional pride rather than the feeling of technology outsmarting them or even replacing them. In this sense the application acts as an assistant rather than a controller giving useful data to the user and the option to make decisions, show and strengthen their abilities. The language and the tone that the Crane Assistant offers is the one of a helper offering options and not giving orders by voice. The application also offers the possibility to give the users some motivation by assigning scores to some of the tasks they have to do giving them the chance to earn scores (proof of their skills) and even trade their points for some rewards like breaks, or time to leave earlier or come later to work. An additional opportunity is offered for them to interact with their co-workers. Cranetopia is a radical solution for the lack of control and motivation in industrial environments that uses gamification as its main resource. 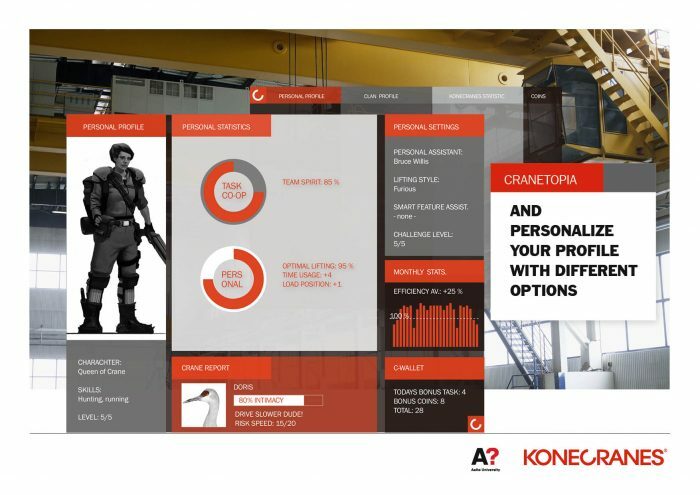 The experience was designed to immerse the users in the world of Cranetopia, which is possible thanks to AR environment creation inside their work places. The users can choose between classes, character customization, missions and competitions against different companies to become the ultimate King or Queen of the Crane. The AR environment of the whole working place allows them to find a different place each day and have different missions that not only bring fun and motivation to the work but also make them become better and make the best out of the new crane features. Examples are following a coin path with the load (safer route) or avoid monsters that can eat your load and make you lose points (the monsters can be simulated where there are things the load can crash with).